After three years of extensive research lead by myself and a team of highly respected, experienced planners and Attorneys that specialize in estate planning, we have developed a unique service, the comprehensive Estate Planning Specialists ESTATE ANALYSIS. What is an EPS ESTATE ANALYSIS? Well, it's really the first step to successful estate planning and peace of mind. Simply put, an EPS Estate Analysis is an impartial review of how your assets would be distributed assuming you had an accurate estate plan versus how they would be distributed based on your current level of planning. It's a hands-on, easy-to-understand evaluation of your personal situation. It offers specific suggestions and recommendations to help you conserve and protect your hard-earned assets from the ravishes of probate, conservatorship and estate taxes. 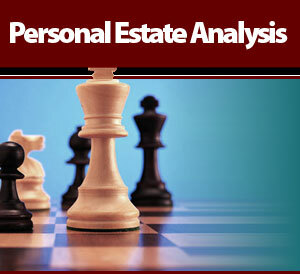 In essence, an EPS Estate Analysis is the blueprint of a successful estate plan. And best of all the EPS Estate Analysis is available for only $497. The EPS ESTATE ANALYSIS is painless. It begins with a simple questionnaire which results in a personalized synopsis that includes an up to the minute projection of your tax bill today, based on your current estate plan. It then compares that tax liability, assuming you have incorporated various key recommended estate planning strategies. Your EPS Estate Analysis will also include your very own personalized "Summary and Recommendations", outlining tools that will not only help you minimize your tax liability, but distribute your wealth in the most equitable, tax-favored manner. Another feature of the EPS Estate Analysis is the useful "Wealth-Creation" ideas that will enable you to build up your estate, and help you attain and maintain the full and proper distribution of your property. Your personalized EPS ESTATE ANALYSIS makes it easy for you to make certain your family's financial security is guaranteed by making you completely aware of where you stand in regard to estate taxation and probate fees. The nice thing about the ESTATE ANALYSIS service is that it takes your goals and needs into account and provides clear concise recommendations. How to begin, you ask? You would never start a journey in a strange country without a road map. The same is true in planning your estate. You should never start without a clear understanding of where you are going and what you want to get out of the trip. The EPS Estate Analysis will be your guide as you travel the road of proper estate planning. Once you are armed with adequate knowledge and strategies, the journey will be an easy one. Regardless of the size and makeup of your estate, you should develop and implement an estate plan to guarantee that your wishes will be carried out exactly as you choose. How to start? That's easy. Request a personalized Estate Analysis. To order your Personalized Estate Analysis, simply add this item to your cart and checkout. One of our planners will follow-up promptly to confirm your details. The more information you provide the more accurate the Analysis and recommendations will be. Plus, for your safety and privacy, all information is kept strictly confidential. Furthermore, all data you provide will be only accessible by our staff and yourself by using your designated password. Of course, if you ever have any questions, please call one of our planners at Estate Planning Specialists toll-free at 888-892-1102. That's all there is to it. Remember, a proper estate plan will benefit you in so many ways. It will help ensure your hard-earned assets are passed to your heirs in the manner you choose. It will help protect your family from unnecessary attorney's fees and legal costs. And it will allow you to take advantage of the latest tax reforms to reduce your estate and income taxes, both federal and state. You owe it to yourself and your family to arm yourself with your very own personalized Estate Analysis, the "Road Map" to a proper estate plan. Too much is at stake... especially if keeping matters private and under your family's control is important to you.